So I was catching up on my episodes of Young Justice with my kids a few weekends ago and meant to post about episode #21 titled "Image". This episode introduced a young Garfield Logan and his mother. It also put the team into conflict with Psimon and shared a tremendous amount of Miss Martian's secrets. Over the course of the story, Gar becomes injured and has to receive a blood transfusion. From Miss Martian. The pretense here is that Miss Martian can shapeshift at the cellular level, so her blood cells could shapeshift to match Gar's. Long story short, that sets everything up for Garfield Logan to return as the Changelin- er, Beast Boy. The second season of Young Justice is given the subtitle of Invasion and propels the storyline forward five years. With that advancement in the story, there is also a change in lineups, with the Young Justice team now including Lagoon Boy, Blue (Jaime Reyes) Beetle, Batgirl, Wonder (Cassie Sandsmark) Girl, Bumblebee and a new Robin (Tim Drake). Oh! And Beast Boy. From Phil Bourassa's Deviantart page, I found this image, of Beast Boy in full-on Beast Mode (apologies to both Phil and Marshawn Lynch). Beast Boy joins the Young Justice team for the second season of Young Justice. 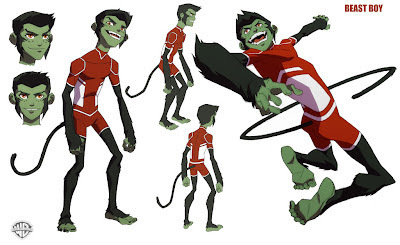 Beast Boy has never been my favorite Doom Patroller, nor Teen Titan, but I do find that I enjoy the character on occassion. Young Justice (so far) is one of those occasions. I like the blend of Changeling costume and more permanent animalistic features. Bourassa's work really updates Gar without making him look any sillier than a green boy who can turn into any animal he can think of should ever be. I have always like Gar Logan, and can't stand the increasingly animalistic treatment of his human form, which has been going on since about 2003. I feel it is a trope that prevents him from having any serious character development as a human character - ie as Dayton's heir or going to college as all the other early titans did. They don't have to bother with that kind of characterization if he's just drooling beast guy supporting cast in the corner. I feel he's always been sold short next to the junior JLA-ers and that has to do in part with how DC sees the Doom Patrol, since Gar is the original DP legacy character. In the episode I mention above, Gar is clearly using the more beastial appearance as a coping mechanism/mask. When he comes to the waterfall and is reminded of his mother's death, he reverts to a human form. While I cannot argue that Beast Boy (if for no other reason than the name change from Changeling) has reverted in recent years, I still like the fact that he is transcending media. Sooner or later, I have to watch this backlog of episodes of Young Justice episodes on my DVR. Despite the fact that I no longer read comics, I still consider myself Gar's #1 fangirl. Right now, I'm debating whether or not to make a server move for www.garfieldlogan.com or to retire the website once and for all. If I closed the website, would anyone notice? over all what do you think of Young Justice?